First of all, I feel like a fraud writing this short blog. Young Ashley Wildes suggested the theme of writing blogs about one or another of the weird and random objects that one stumbles across in the vast storage areas here in our 15,000 square foot school building. Our blog editor Matt Histand and I both thought it a good enough idea. I primarily thought it was a good idea because I assumed that I would be exempt from contributing. After all, I am the one who is responsible for pretty much all of the over quarter-of-a-million objects being here in the first place. Not every man can pull off a skirt, but with gams like that it's no wonder March was a star. For me to wax ecstatic about “finding” something that I was apparently surprised and delighted about enough to buy at some time in the past seemed just a trifle disingenuous. However, Ashley just contributed a blog, and Matt is staring balefully across the room at me because no one else has stepped up and written one this week. So I guess I’ll be forced to elaborate on an item that has just crossed my desk for cataloguing. 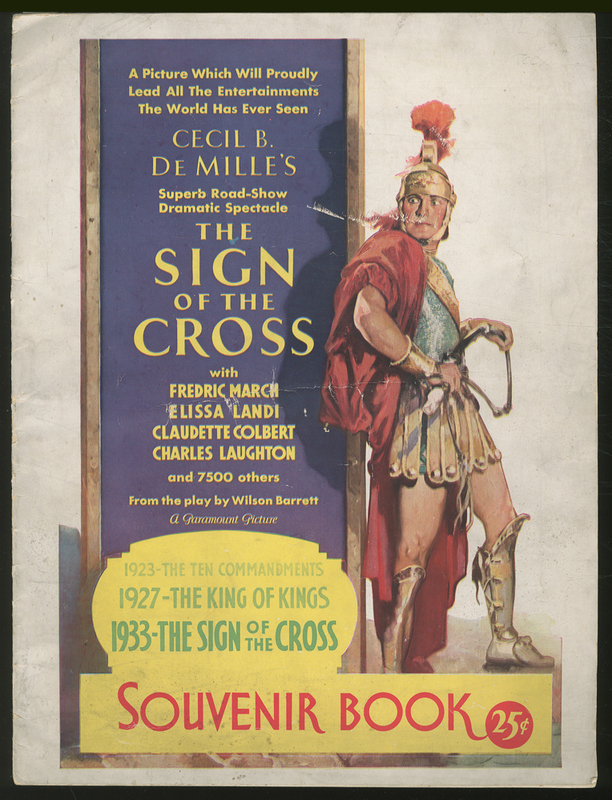 Thus, I will present a Souvenir Book for Cecil B. DeMille’s film The Sign of the Cross. I like film souvenir books well enough, but with a few exceptions it’s a little hard to get truly excited about them. De Mille’s 1932 film, based on the play by Wilson Barrett, has a backstory about Charles Laughton as the Emperor Nero. Nero blames the Christians for burning Rome, and decides to put them all to death, as one is occasionally wont to do. 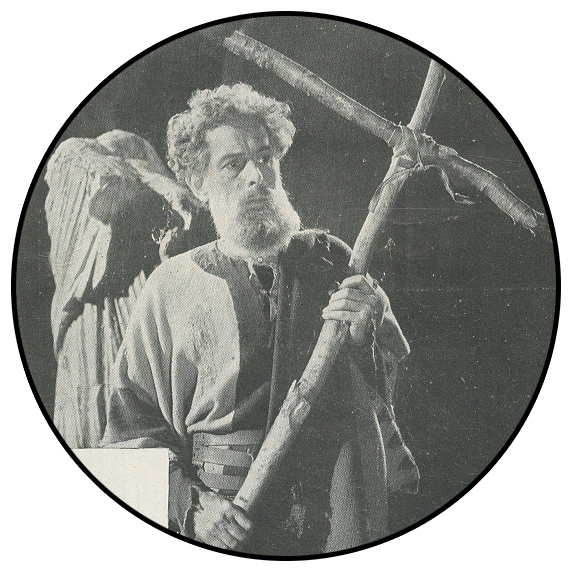 A beard and cross is Hollywood shorthand for Christian. There’s also a love story between Frederic March as Rome’s highest-ranking military officer, Marcus Superbus (really? Superbus? Why not “Marcus Gas Guzzling SUV”?) and Elissa Landi as Mercia, a cute Christian chick. You can see where complications might ensue. If this lavishly illustrated booklet is any indication, Nero probably had no trouble identifying the long-suffering Christians. It’s hard to miss them with those silly beards. Extra credit will be awarded to anyone who can identify the other 7500. No peeking. 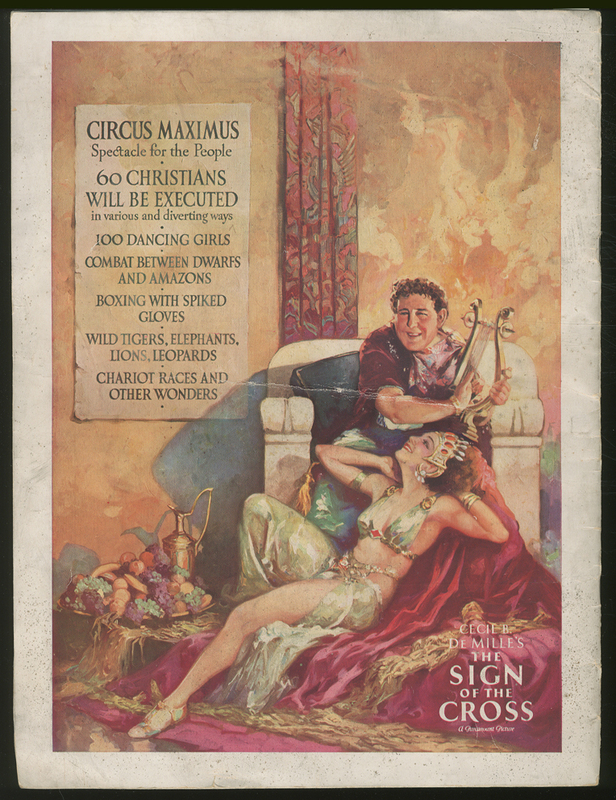 The rear wrapper features an elaborate artist’s rendering in grand Hollywood style of Laughton cheerfully providing background music on the lyre as Rome burns, with a woman who almost certainly shouldn’t wear white to her wedding, smoldering at his feet. Okay, it goes on from there, but they had me at “Combat between Dwarfs and Amazons.” I mean, when planning spectacles for the disgruntled masses, don’t you think it’s always the details that matter most? In all the sand and sandals epics I’ve watched in film and on television, I’ve yet to see one that featured a purveyor of dwarfs and amazons. But then, as we’ve learned in the rare book trade, it pays to specialize. Probably not a woman to bring home to mother. As we are always at leisure here at BTC, this remarkable broadside engendered a deep and learned discussion about the pluralization of the word “dwarf.” Cecil B. apparently goes for “dwarfs” while I was always of the opinion that it should be “dwarves.” Matt seems to intimate that the animated Disney epic Snow White and the Seven Dwarfs was a game changer in the pluralization of dwarfs, but The Sign of the Cross predates Snow White by half a decade anyway. Maybe we’re on to something! Oh, well, as deep and learned discussions at BTC often do, we lost interest in it almost immediately. Perhaps someone else can enlighten us. You know, as I think on it “Combat between Dwarfs and Amazons” sounds a little bit like one of the seasonal diversions at the BTC Christmas Party! Why Are Some Dustjackets Clipped but Not Price-Clipped? 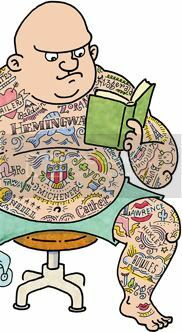 Will [The] Real Huck Finn Please Stand Up? “Extras,” is how they’re usually identified (aka “a cast of thousands”), including Marge Flumbaster, who came to Hollywood from Kansas in search of stardom and would up pounding the pavement as an extra. Now, however, they’re called “atmosphere players.” But atmosphere player credit is a bit much; extra credit will suffice. Thank you in advance for gift certificate, Tom.